1. Remove spinach leaves from stem and rinse thoroughly in water. 2. Take a deep pan and add washed spinach leaves, garlic flakes, green chily, soaked moong dal (for color) and chopped tomatoes. 3. Add little water, cover the lid and cook for 5 mins. 4. Turn off the heat and make the spinach cool. 5. Now blend the spinach mixture with a blender and make a thick smooth paste. 6. Heat oil in a deep heavy pan and add cumin seeds. 7. When the seed starts crackling add spinach paste and stir for a min. 8. Add turmeric powder, hing , salt, water (if required) and mix well. 9. Add pieces of cottage cheese, fresh cream, red chily powder, garam masala and mix it well. 10. Cook till the gravy starts boiling. 11. Garnish with fresh cream and serve hot with Roti, Naan or Jeera Rice. Notes: You can also add fried paneer cubes into the spinach curry. 1. Boil water in a deep pan and when the water starts boiling add vermicelli. Mix it well and cook 3-4 minutes till it gets tender. 2. Once the vermicelli gets cooked, drain off to a colander and rinse with water. Set aside and let it cool down completely. 3. Grate the boiled potatoes or you can finely mashed it also. 4. Put boiled vermicelli in a bowl and add grated potatoes, grated carrot, chopped Coriander leaves , chopped green chilly, grated ginger or ginger paste, green peas, Garam masala powder, Cumin powder, Salt to taste, , Red chilly powder, bread crumbs, roasted peanut powder and lemon juice. Mix all the ingredients until well combined. 5. If the mixture is sticky add more bread crumbs accordingly. 6. Take a generous portion of mixture and make small balls out of the mixture by rolling between your hands. Prepare rest of the balls in the same way. 7. Put all purpose flour/maida in a bowl and make thin paste with water. Mix it well till no lumps. 8. Put dry roasted vermicelli in a grinder and coarsely powder it. I have taken roasted vermicelli but if you do not have roasted one then roast the vermicelli and use it for coating. 9. 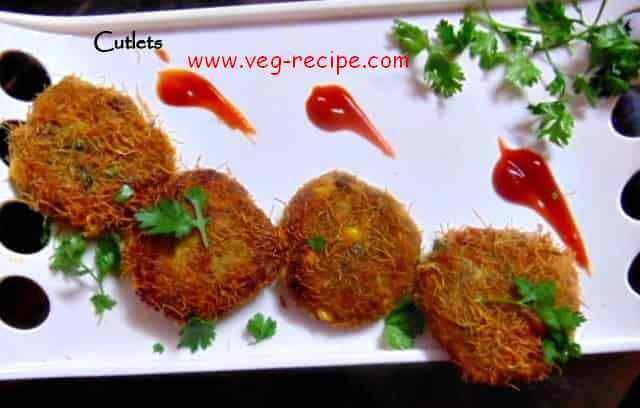 Dip each Cutlet one by one with flour paste and then coat with dry roasted vermicelli all around the cutlets completely. Prepare rest of the Potato vermicelli cutlets in the same way. 10. Keep it in a refrigerator for 30 minutes to make the mixture firm but if you do not have much time fry it instantly. 12. Fry the until they are golden brown, turning occasionally. This would take about 4-5 minutes. Take them out over a paper towel or an absorbent paper. 13. Serve hot with any green chutney or tomato ketchup. 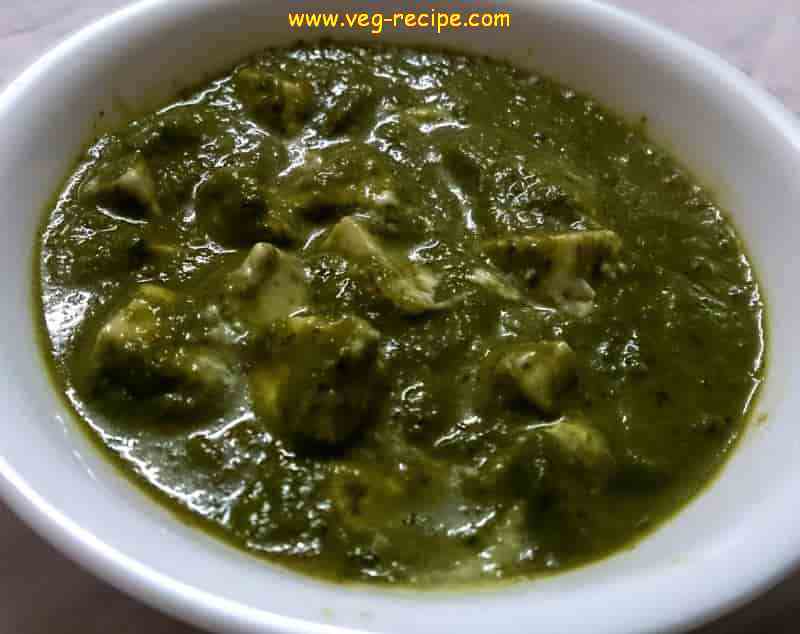 I have added green chilly but do not add green chilly if you are going to make for kids. If you do not have roasted vermicelli then you can also use bread crumbs for coating. 1. Wash rice 2-3 times and soak it in water for 10 minutes. Drain the water. 2. Boil 5-6 cups of water in a pot. Once water starts to boil, add rice and cook till 90% cooked. Drain the rice and keep aside. Make sure you do not overcook rice. 3. Heat oil in a pan. 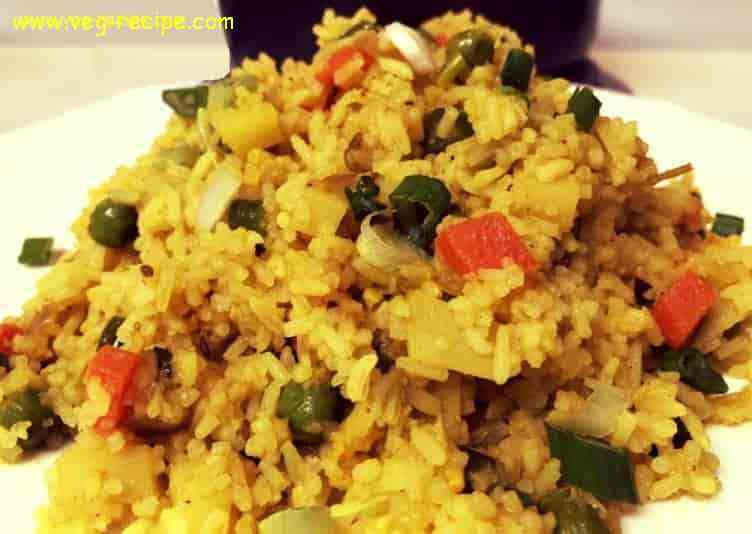 Usually tawa pulao is a street food in India and it is fried on a huge tawa. As, we do not use that kind of huge tawa at home, we are using pan to fry the pulao. 5. Add ginger-garlic-chili paste and saute for another 1 minute. 6. Add tomatoes, chopped vegetables(bell pepper, potato, green peas. carrots, beans) and salt. Sprinkle a few drops of water and cover it for 5 minutes or till vegetable are cooked well. You may use any choice of vegetables and cut into very small pieces, so it gets cooked soon. 7. Add cooked rice, salt, turmeric powder and pav bhaji masala powder. Mix gently and cook for 2-3 minutes. 8. Turn off the heat. Garnish with fresh coriander leaves, spring onions and a piece of lemon. 1. Put finely chopped mixed veggies in a bowl and add all the spices and mix it. 2. Take roti and take some cheese spread and spread all over the roti. 3. Now apply some pizza pasta sauce and spread it. 4. Spread some grated mozzarella cheese. 5. Put some finely chopped veggies and spread all over the roti. 6. Lastly add some more grated mozzarella cheese and sprinkle little olive oil. 7. Repeat the same process for rest of the roti. 1. Grease the baking tray with some olive oil and put roti pizza in a tray. 1. Grease non-stick pan with olive oil and put roti pizza in a pan and cover the lid and cook it on low flame till cheese melted and roti become slightly crisp. 2. It will take around 7 minutes to get ready in a pan. 3. 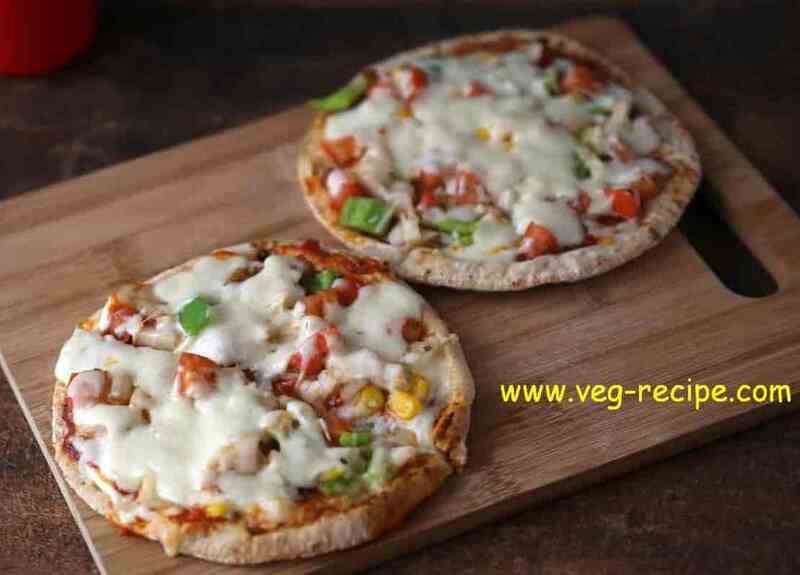 Take out the Roti pizza from Oven and pan and lastly garnish it by sprinkling some pizza seasoning, red chilly flakes etc. 4. Take pizza cutter and cut into four slices. 5. Roti pizza is ready to serve. Serve hot and enjoy !